We would love for you to join us Sunday mornings! We have three worship services in the morning for whatever style of worship you prefer. 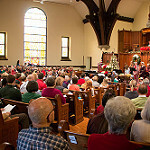 Early Sanctuary Worship – 8 a.m.
A small and intimate, traditional worship service which takes place in the Sanctuary. 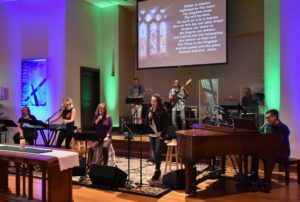 Visions Worship – 9 a.m.
A contemporary worship service that meets in our Great Room and is less formal than the Sanctuary services. Come as you are, enjoy a fresh cup of coffee, a snack, and worship music from the Visions Worship band. Join us as at 9 a.m. as we celebrate Jesus together. Sanctuary Worship – 11 a.m.
A traditional service that meets in the Sanctuary at 11 a.m. We use a traditional form of liturgy and music through this service. Enjoy traditional organ and Chancel Choir music. Everyone is welcome as we celebrate the ways that God is at work in our lives and in the world. All are invited to participate in a variety of music ministries that support our worship services.